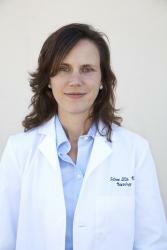 About Dr. Ellis | Selena Ellis, M.D. Dr. Ellis attended medical school at the University of Washington in Seattle, Washington, and completed her neurology residency at the UCLA School of Medicine in 2002. She then spent a year as Chief Resident and Fellow at the Wadsworth VA/UCLA Department of Neurology, where she obtained subspecialty training in electrodiagnosis of neuromuscular disease. Dr. Ellis treats common neurologic disorders such as headache, peripheral neuropathy, among others. Other common symptoms in our practice include pain syndromes of many types, difficulty with gait or balance, and sensory changes to the arms or legs. An initial consultation with Dr. Ellis will allow for a lengthy and detailed history and examination. She will order any necessary tests, including blood work, MRI scan, nerve testing (EMG/NCS), and EEG (brain wave study). After a diagnosis is made, Dr. Ellis will continue management of symptoms. Dr. Ellis also has subspecialty training in evaluation and management of problems affecting the peripheral nervous system, including systemic neuropathies, mononeuropathy and radiculopathy. Dr. Ellis holds board certification with the American Board of Psychiatry and Neurology and with the American Board of Electrodiagnostic Medicine.